With a breathtaking summer sun setting over the green hills of the Umbria region, Umbra Institute staff member Zach wrapped up his “Nooks and Crannies” tour of Perugia for the newly arrived Full Immersion students. The walking tour provided students the opportunity to explore the city’s centuries with a modern day twist, dispelling age-old rumors while creating a mental map of the narrow and winding streets. Students laughed along as Zach cracked a few of his infamous jokes and snapped some photos of what has become their new home. 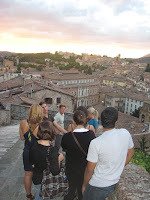 As the Full Immersion students wake up to their third sunrise in Italy, they are prepared to embark on an unforgettable and educational adventure abroad.